From miles of flats to the steeps, crossing Echo Peak from Echo Lakes to Angora Lakes is the quintessential contrast of terrain. You should pick this tour because you relish the challenge of the very steep descent from the summit of Echo Peak combined with a relatively long tour. 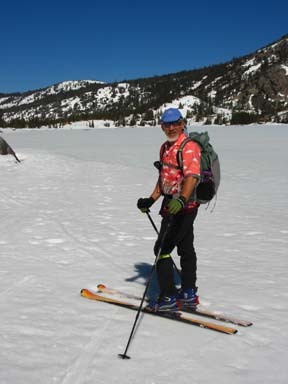 First you ski two miles across Echo Lakes cradled between Becker Peak, Talking Mountain, Flagpole Peak and Echo Peak. This section in itself is filled contrast; the lake is flat and stark yet surrounded by steep ridges. Then you climb to the summit of Echo Peak. Here you are treated to an amazing 360-degree panorama. Below to the north are Angora Lakes nestled up among the steep cliffs of Echo Peak. Farther to the north is the deep blue of Fallen Leaf Lake and Lake Tahoe. To the south are Echo Lakes and views beyond. Next comes the descent from Echo Peak to Angora Lakes. It's steep; more than 1300-feet in one mile. The tour ends with more than three miles of level and moderate downhill terrain. Picking the right time to ski this tour requires guessing what the snow conditions will be on the north side of Echo Peak. On the south side the snow consolidates and turns to corn quickly due to the south-facing slope. On the north side powder lingers because the sun does not hit these slopes, but this translates to very slow consolidation. In fact, don't visit looking for spring corn; plan a trip for powder conditions for the best skiing. 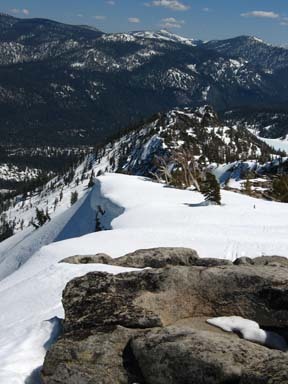 Be aware that Echo Peak is on the border of Desolation Wilderness and the tour to the peak goes through the Wilderness. According to the Forest Service you must obtain a permit for day use as well as overnight camping in Desolation Wilderness. 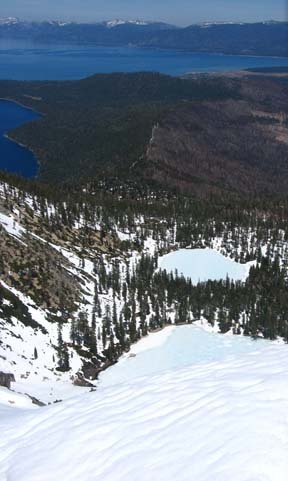 If it is safe, ski northwest across the lower lake for 1.4 miles until your each its northwest end (3). Otherwise ski along the south edge of Echo Lakes. Skiing along the summer trail on the north side of the lakes is slow, more difficult, and no substitute for the open, hard-packed surface of the lakes. Ski west for 0.4 mile until the terrain to the north becomes less steep (6) (there is no landmark). 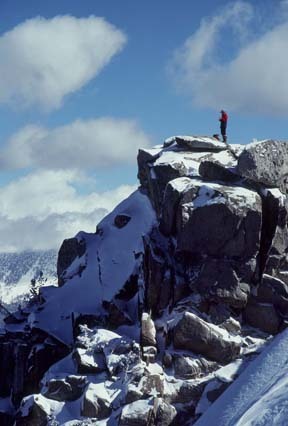 Ski in an arc, first north and ending east, for 1.4 miles until you reach the summit of Echo Peak (7). Ski east along the ridge for 0.1 mile until you reach a point where you can safely leave the ridge to the north (8) and reach the broad ridge that heads northeast. Descend onto the broad ridge and follow it northeast and finally north for a total of 0.9 mile until you reach Angora Lakes (9). The ridge is usually the safest place near the top; as you descend you can move into the shallow gully to the west of the ridge where mature trees provide some protection from avalanches. Be sure to assess the avalanche conditions before attempting the descent. Locate the road and follow it generally northeast for 1.0 mile until you reach a ridgetop (10). Ski northeast on the ridge and road for 0.7 mile until you reach Angora Lookout (11). 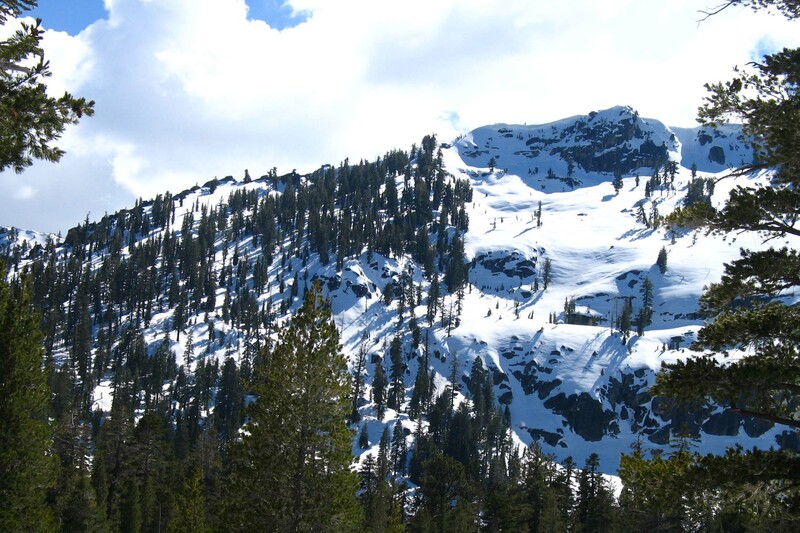 Continue to the northeast for 1.8 miles until you reach Tahoe Mountain Road (12). The first 1.2 miles descends steadily and the last 0.6 mile is level. You will pass to the west (left) of a small meadow as you approach Tahoe Mountain Road. Turn east (right) onto Tahoe Mountain Road and follow it for 0.1 mile to the end of the tour (13). You will need to walk this section if it is plowed.